Seeking a succinct summary of current Russian military aircraft? 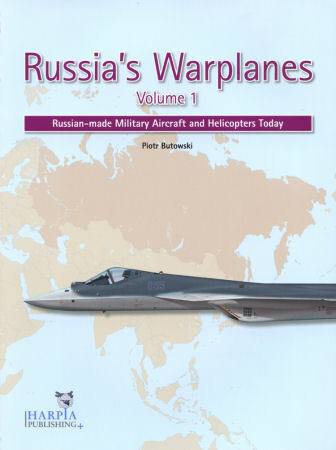 Grab Russia’s Warplanes – first in a two-volume set from Harpia Publishing. Coverage authoritatively sorts and settles the bewildering range of aircraft subtypes and suffixes. Production, prototype and project designs. Fixed- and rotary-wing. Manned and unmanned. Current and “future”. Even military balloons! But don’t expect classics like the MiG-21 and Su-22: Russia no longer operates these – and they’re “excluded”. Within chapters, individual entries include, among other things, manufacturer, role, power plant, dimensions, performance, armament, “history” and operators. The Su-25 section, for instance, spans eight pages – and lists no fewer than 19 variants and proposals. Mi-8/-17 coverage, by contrast, traverses two chapters – and recaps at least 75 Hip iterations! Hundreds of color photos and detail images tincture text. A single appendix with map – showing, by the way, Crimea in Ukrainian hands – lists Russian “Aircraft Design, Scientific and Production Facilities”. This reliable reference wonderfully recaps current Russian warplanes. I, for one, eagerly await its sequel. If your library affords space for just one reference on modern Russian military aircraft, make it this one.